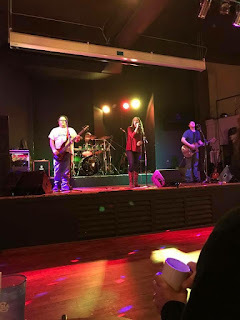 I HAD A rare Saturday night off, so I went to One Restaurant and checked out a fairly new area band called Funhouse Riot. They were excellent - great songs, tight chops, and a girl singer who can really belt it out. Once they play a few shows and get the stage presence thing down, Funhouse Riot could be a real force around here, and I encourage you to check them out the next time they play. The band scene is cyclical. Right now we are on the downswing around here - there aren't as many places to play, and bar owners are leery about forking over $700 plus for a local band instead of giving the solo acoustic acts less money. There are no young upstart bands in the area playing regularly, sadly. I will have more on this topic soon. So I'm glad a band like Funhouse Riot is making an effort. I'm usually playing somewhere on the weekends or just generally collapsing after a busy week at the store, and now I'm doing some stuff for the Whig in sports. Sheryl was exhausted too Saturday, but I sucked it up and went out - you only get so many chances to see other bands. When I first left sports in the late 1990s, I had trouble just watching games. I was always breaking it down and trying to figure out a way to write the story, instead of just enjoying the contest. I find myself doing the same thing when watching a local band - what are they doing, how are they doing it, what PA are they using, how do they transition from song to song, how do they interact with the crowd and each other, and on and on and on. Geesh, Hoser. Chill! Enjoy the dang band and have a good time - that's what live music is all about.